NEW YORK (CNNMoney) -- Those who clamor for more "limited government" rarely define what they mean. But assuming nothing changes over the next decade, Americans could be left with a de facto limited government -- limited in what it will be able to do. Today, the United States spends roughly 76 cents of every federal tax dollar on just four things: Medicare, Medicaid, Social Security and interest on the $14 trillion debt. 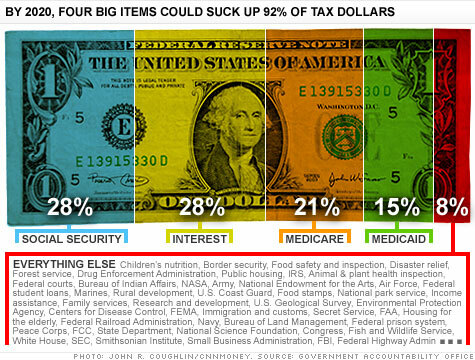 That leaves 24 cents of revenue to pay for everything else the federal government does. That's not a lot. But it's a mint compared to what could be left over by 2020, according to a simulation made by the Government Accountability Office. Barring serious efforts to curb the growth in the country's debt, by 2020 Washington could be spending 92 cents of every tax dollar on Medicare, Medicaid, Social Security and interest alone. That would leave just 8 cents to pay for everything else. How much of "everything else" can 8 cents buy? Not a lot, especially relative to what Americans are accustomed to their government providing. Things like the national parks, the FBI, student loans, air traffic controllers, defense, the interstate highway system and food safety. The list goes on and on. To give a better sense of just how much government would have to cut back, consider this: In 2010, Uncle Sam took in $2.162 trillion in federal revenue -- and 8% of that is $173 billion. The Departments of Education ($93 billion) and Homeland Security ($44 billion), plus NASA ($19 billion), the EPA ($11 billion) and the parks, fish and wild life services ($6 billion). Beyond 2020, the 8 cents to pay for "everything else" would get whittled down to zero. By 2040, there would only be enough in federal tax revenue to pay for interest on the debt and Social Security, according to Susan Irving, GAO's director of federal budget analysis. Sure, the country could try to borrow to pay for what revenue can't cover. But given the magnitude of what would have to be borrowed, the interest costs alone would be prohibitive. Another alternative: the government could abruptly raise taxes sky high and cut spending to the bone. This is just one reason why the country's fiscal course is often described as "unsustainable." And that's why Irving and others say lawmakers and the public need to ask some tough questions about their priorities and their means. "What is it that the government should do? What would that cost? Are you willing to spend that?" Or, Irving suggested, "What do you want to pay for government and what will that cover? Can that fund your priorities?" In the abstract, she noted, "Everybody wants a small government. Everybody would like low taxes. And they'd like government to do everything that they think government should do. But the arithmetic can be a problem."